Welcome to the Rability (Rabbit Agility) web site. What exactly is rabbit agility? It is the process of training a rabbit to respond to your commands (go, left, right, jump, wait, etc...) so you can have the rabbit run an obstacle course that can consist of jumps, arch jumps (see image on left), bridges, a-frames, pause boxes, water jumps, teeter totters, tire jumps, weave poles, long jumps, and probably many others. Rabbit agility also called "rabbit hopping" or "rabbit jumping" seems to have originated in Scandinavia with straight runs through the jumps but in the United States it has emerged as agility courses. Well you may be wondering how the heck I got into rabbit agility; It all started with my son who had wanted a rabbit for a couple years before we finally relented and adopted one from the Minnesota Animal Humane Society. From past experience with my older son who just had to have a dog, want to guess who takes care of the dog now, I wanted to have something to keep my son's interest in the rabbit. In with the many papers from the rabbit's adoption came a sheet for a class on rabbit agility from the Humane Society (really taught by folks from the Minnesota Companion Rabbit Society) so we signed the rabbit up for class. Bottom line two years later my son is still interested in his rabbits. 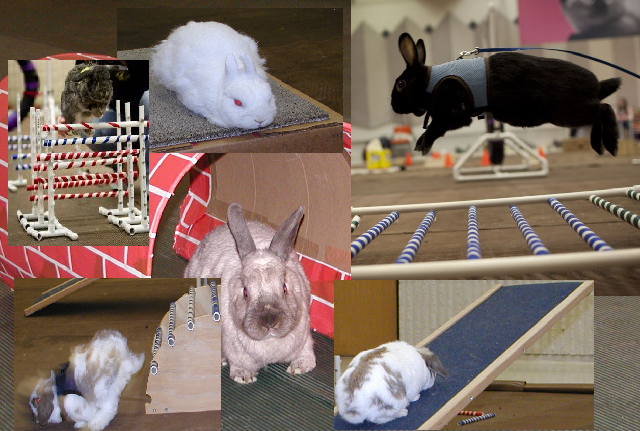 We now have 4 house rabbits that are involved in agility and therapy work/community services.